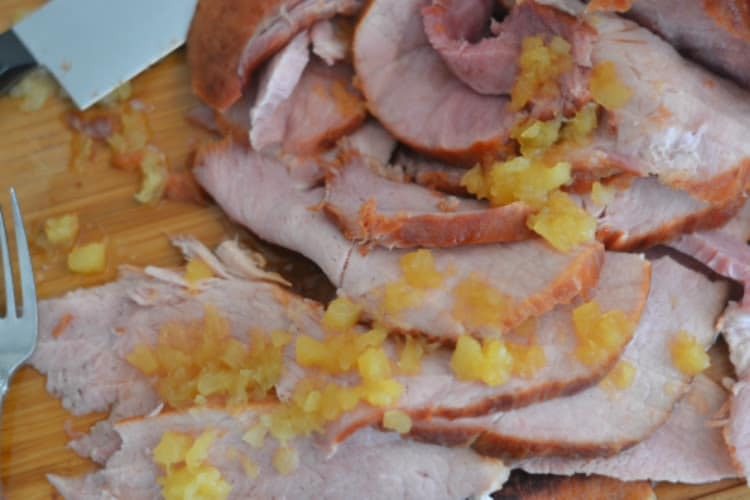 Instant Pot or Ninja Foodi Brown Sugar Pineapple Ham is the tastiest way to serve up your ham for your holiday feast! Simple ingredients and no oven space is needed for this sweet and savory brown sugar pineapple ham! 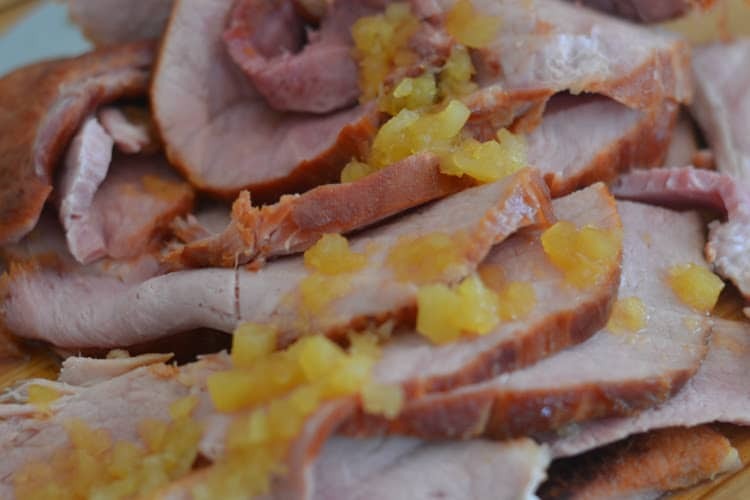 If you love a sweetly flavored ham than this recipe is right up your alley. Moist, juicy, and so easy to make. You will never want to make ham in the oven again. Easter is almost here and if you are looking for the perfect way to cook your ham than try my recipe! 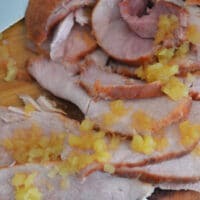 The Instant Pot or Ninja Foodi will cook your ham in a fraction of the time and infuse the pineapple and brown sugar flavors into the ham, so each bite is outstanding! Here is the thing for years I would bake my ham in the oven. Now I have a Foodi that is a pressure cooker and Air Fryer in one, along with my Instant Pot. I have found that I get a more flavorful and moist ham if I use my Foodi or Instant Pot va baking it in the oven. The oven can dry it out, where the Instant Pot seals tight and then keep all that moisture in the post so it comes out even juicier than when you put it in to cook. Feel free to pair with any of your favorite sides. If it is for a holiday reach for all your classic dishes. Or if this ham is a weeknight meal for no special occasion than reach for any sides! If you purchased a pre-cooked ham you can still use this recipe to add depth and more layers of flavor to your ham. Most hams you purchase in the store are already fully or partially cooked. Just make sure to read the label. Cooking a pre-cooked ham is going to allow you to flavor your ham. You will add layers of sweetness and a tasty glaze to your ham. If you are the ham plain it might not offer much flavor. There are so many cuts of ham and depending on where you live will depend what is available. For Brown Sugar Pineapple Ham a bone-in pre-cooked Ham works great. The spiral hams do really well, just leave the flavoring packet that comes with it out, if it is a flavored ham. Bone In hams give you a more juicy end result. Just like with chicken on the bone or pork on the bone you always develop more flavor. The spiral portion allows all the brown sugar and pineapple to soak into the ham in all the crevices! If you can’t find a bone-in that is totally fine, boneless will work. If you are planning to buy for a crowd and want to know how much ham should I buy, here’s a guide. Aim for ¾ a pound per person with a bone-in style ham. So a 10 pound bone in ham can serve around 13 people. Give my incredible Instant Pot or Ninja Foodi Ham Recipe a try! It is a delicious way to serve ham to your friends and family with minimal effort required! Pour 1/2 cup brown sugar in the bottom of the Instant Pot, spreading it around. Cut a little ham off the edges if it doesn't fit. Place Ham in the Instant pot. Pour crushed pineapple and juice over the top of your ham. Pour Honey over the top and 1/2 cup brown sugar. Press Pressure (it should automatically set to HIGH pressure). Set time to 15 minutes. Hit START. Once done, do a quick release. Thank you Adventures of a Nurse for this delicious recipe. I could not have made it without the help of yours.